DETAILS: PLEASE NOTE: please check the measurements carefully, if you not sure what size you wear please provide your bust, waist and hips measurements. Do Provide us your CONTACT number when you place an order. 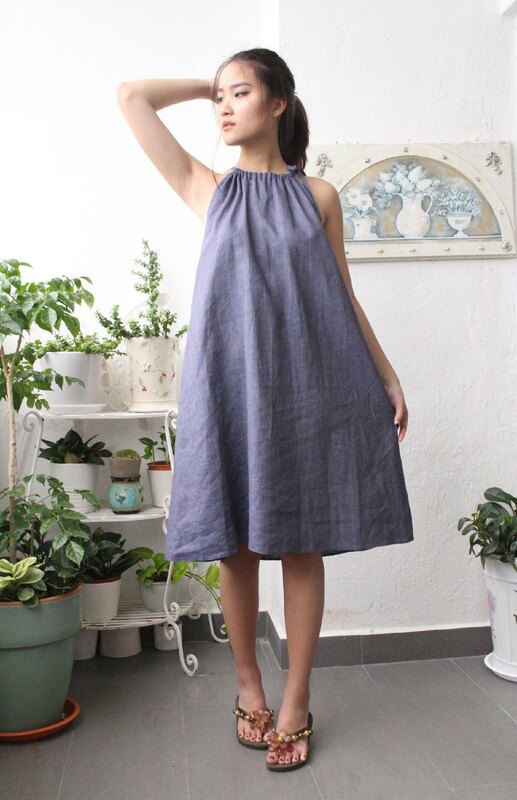 - Dress length about 39''(99cm) - Can be made in different sizes - Made from 100 % pure linen - Medium weight linen * Model wear size S * Model is 169 cm high 5.6" * Model measurements (bust 33" / waist 26" / hips 35.5" ) TAKING CARE: - hand wash gentle; - dry gentle; - Iron upside down at medium high; * Please note that actual colors may vary due to shooting and your computer resolution and monitor color restrictions SIZING (XS) BODY. Recommended Bust: 31.5'' (80.01cm) Waist: 24.5'' (62.23cm) Hips: 34' '(86.36cm) CLOTH. Measurements Bust: 38.5'' (98cm) Waist: 40.5'' (103cm) Hips: 44.5 '' (113cm) ========================= (S) BODY. Recommended Bust: 33'' (83.82cm) Waist: 26'' (66.04cm) Hips: 35.5'' (90.17cm) CLOTH. Measurements Bust: 40'' (101.5cm) Waist: 42'' (106.5cm) Hips: 46 '' (117cm) ========================== (M) BODY. Recommended Bust: 34.5'' (87.63cm) Waist: 27.5'' (69.85cm) Hips: 37'' (93.98cm) CLOTH. Measurements Bust: 41.5 '' (105.5cm) Waist: 43.5 '' (110.5cm) Hips: 47.5'' (120.5cm) =========================== (L) BODY. Recommended Bust: 36'' (91.44cm) Waist: 29'' (73.66cm) Hips: 38.5'' (97.79cm) CLOTH. Measurements Bust: 43 '' (109cm) Waist: 45'' (114cm) Hips: 49 '' (124.5cm) ============================ (XL) BODY. Recommended Bust: 37.5'' (95.25cm) Waist: 30.5'' (77.47cm) Hips: 40'' (101.6cm) CLOTH. Measurements Bust: 44.5 '' (113cm) Waist: 46.5'' (118cm) Hips: 50.5'' (128cm) ============================= (XXL) BODY. Recommended Bust: 39'' (99.06cm) Waist: 32'' (81.28cm) Hips: 41.5'' (105.41cm) CLOTH. Measurements Bust: 46'' (117cm) Waist: 48 '' (122cm) Hips : 52'' (132cm) ============================= * Please let us know if you need different measurements.